P6,000 for 12Mbps... 1.5MB/s or a TV episode for every 4 minutes. ...imagine teh pr0n you can download in a hour! Mahal pa rin. 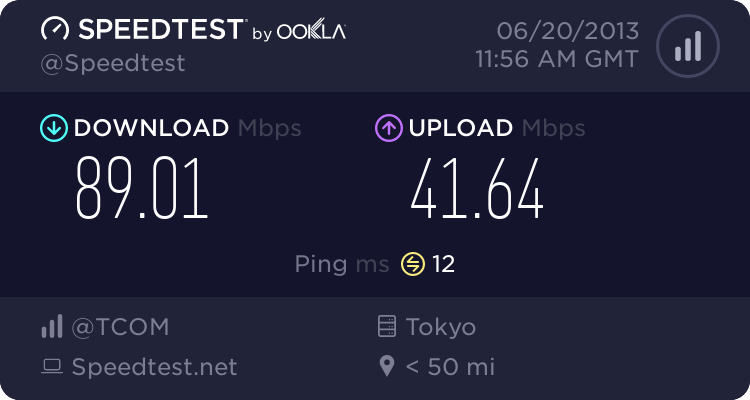 I miss my 100Mbps Hikari connection, at almost P3000 lang. musta ang latency pag malaki na ang bandwith? does it mean mas better ang latency pag bigger ang bandwidth? ikaw ang seeder ba master zero??? nope, si heishi ang may license maging pr0nmastA. Depende yan sa seeds. I downloaded the first season of Life on Mars in 3 hrs, but took 3 days to finish Discovery Channels documentaries on WW2 battles, when I was still on Hikari. usually less than 40ms yung latency pag bigger bandwidth so far imho. High peak bandwidth/throughput doesn't automatically guarantee low latency. 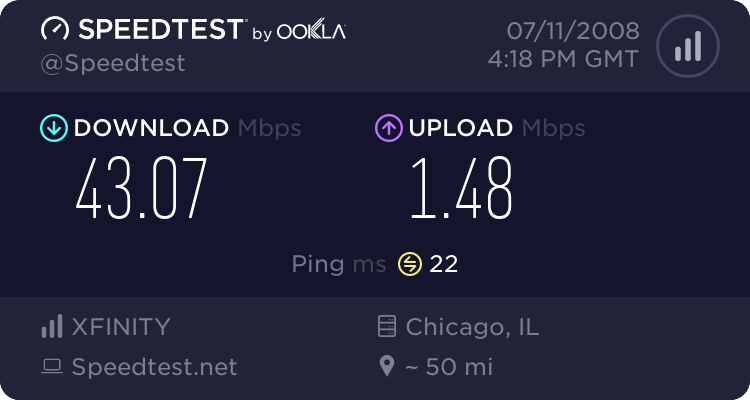 You can have a 24Mbps DSL connection and still suffer from very high pings. are you on sky broadband? Obviously trying to ping a US site from here will result in 3 digit pings. It's just too geographically far off to get less than that, even if you had the best connect running through the straightest cable and the least hops. OTOH, a Sky/Bayantel connect pinging the Sky/Bayantel speedtest.net server won't be a good indication of that connection's real-world latency. A friend subscribed to the service a month and a half ago. and worst of all, his service suddenly goes haywire when it starts to pour. He lives in the eastwood area. Now, that's not good news. i've inquired about the service, sadly the area covered in marikina is only in parang. i want to avail of the 15-day trial hehehe.